Manitou have been teasing the industry with promises to show off the unreleased MHT 1490 telehandler at this year’s CONEXPO in Las Vegas. 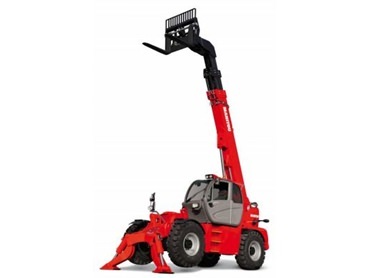 The new high-capacity telescopic forklift is rated to nine tonnes and has a lifting height of 46 feet (14m). The MHT series comes in several high capacity models, including 12 tonnes, 18 and 22.5 tonnes. MHT models with 35 and 40 tonnes capacity are expected to make their debut in June 2014. The new high capacity telehandlers feature a 176 horse power, Mercedes Final Tier IV engine. The MHT Series is the first Manitou series to feature this engine, a 5.13 litre, four cylinder with 750 Nm of torque. It’s equipped with an Exhaust Gas Recycling valve and Selective Catalytic reduction, so the machine requires a diesel exhaust fluid additive such as AdBlue. The MHT 1490 also has a hydrostatic transmission coupled to the gearbox for driving at speeds up to 40 km/h. The MHT also features a triplex chain boom with all components such as hoses, actuators and chains all mounted inside the telescopic boom tube to ensure that there won’t be any damage incidents resulting from boom contact. Automatic rear axle locking provides better lateral stability, allowing the MHT to be designed and built for such high capacities.